"Our battle with them has just begun." 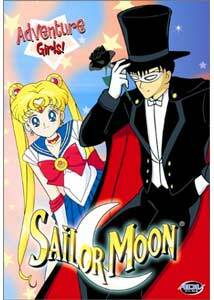 ADV presents another six episodes of the English dubbed version of Sailor Moon. The next stage for the Sailor Scouts has begun, with Sailor Venus and her talking cat Artemis on board, and the revelation of the identity of the Moon Princess. Now, it is up the Scouts to fend off the Negaverse's latest villain and defend the Imperium Silver Crystal. Things were picking up nicely when we last left off, and the first episode differs from the others as a follow up to the major unveilings from the previous disc. As her memories from the distant past are revealed, the true place Serena and Darien take in the story comes to light, but the news is a bit too much for the Sailor Scout. Her reaction is to reject her destiny and try lead a normal life, which of course, she can't. This distraction doesn't last for long however, and we are back to the formula for what is to come, though there are some new wildcards at play. With Tuxedo Mask now a minion of the Negaverse, he also has his own ideas as to how to handle the Sailor Scouts and reclaim the crystal, which is in conflict with Malachite's plans. His timely interventions also spark hope from the Scouts that somehow Darien can be saved, but these are dashed when he vows to return and fulfill his quest. With the show is nearing the end of its first season, the emphasis is on making sure we know who the evil forces are, but unless the audience has been asleep, they don't need the constant reminders. Most of these episodes have the girls trying to escape being Scouts and just have fun, but they are routinely faced with more bad guys to contend with, including a psycho stylist, a finishing-school marm, some evil figure skaters and a killer ski bunny. There is a good deal of humor involved, and the stories are generally interesting, but with the outcome predictable, they do feel like filler for the most part, especially if viewed in succession. I'm hoping the next disc will have a bit more drama outside the expected, and throw a few curve balls to up the interest. Image Transfer Review: The series continues to get a consistent transfer, which looks pretty good overall. Colors, while not eye popping, are solid, as are black levels. There is some minor print damage and visible grain, plus some occasional rainbowing, and nominal aliasing present. If you've seen any of the previous releases, you know what to expect. Audio Transfer Review: Audio remains a strong point on this English-only release. The tonal coverage remains impressive with good low frequency coverage, and dialogue is clear and distinct. Stereo imaging isn't utilized much, but works for the show. Extras Review: Extras are again limited to previews for Princess Nine, Sakura Wars 2, Medabots, Soul Hunter, Martian Successor Nadesico, and Dirty Pair Flash. Menus follow a similar theme and layout to previous volumes, with a different background picture. The first of five chapter stops per episode are available from the menu. After the conclusion of the previous disc's story, we're back to the tried and true, with a few twists added. The addition of Sailor Venus and Artemis pads the cast, but the majority of these episodes are just more of the same formula, which isn't bad if spread out, but become pretty repetitious if viewed in a single session.